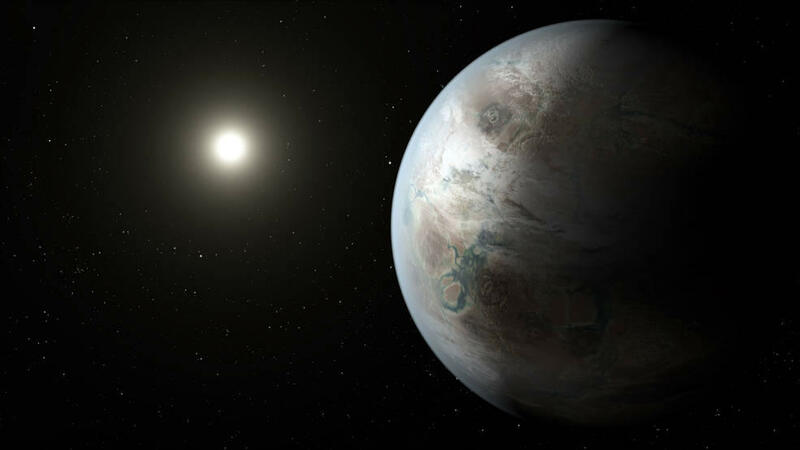 Artist's rendition of Kepler-452b, an exoplanet that could possibly harbor life. Episode aired Friday, Aug. 26 & Wednesday, Aug. 31, 2016. Since the first exoplanet discovery in 1992, scientists have discovered over 2300 exoplanets and are working on confirming almost 5000 more. The goals of exoplanet research are to understand the structure and diversity of planetary systems and to detect planets that could support life. We have learned that exoplanets are common and very diverse and that most sun-like stars have at least one planet. Since 2009, NASA’s Kepler spacecraft has been searching for exoplanets. As a planet passes in front of a star, starlight will dim, so Kepler looks for stars that dim and then brighten again. After Kepler detects a change in brightness, astronomers use other telescopes to confirm that the change was caused by an exoplanet and then learn more about the planet. The Kepler mission is helping us understand other planets and planetary systems. Like the planets in our own solar system, exoplanets are diverse. Some exoplanets are small and rocky with thin atmospheres, like Earth and Mars. Other exoplanets are giants with very thick atmospheres, like Jupiter. Many planets are in multi-planet systems, like our own solar system with its eight planets, and some exoplanets orbit more than one star. Imagine living on a planet that orbits three suns! A major goal of this research is to detect exoplanets that have the potential to support life. For a planet to have life, it needs to be rocky, have liquid water, and be old enough for life to have developed. Some exoplanets fit these requirements, but so far it is unknown whether these planets have life. The more than 2300 exoplanets that have been found orbit stars in our own Milky Way galaxy. Scientists estimate the Milky Way has 160 billion planets among its 100 billion or more stars. Beyond the Milky Way, there are billions of other galaxies with stars that could have planets. Many exoplanets could have liquid water and the potential to harbor life, but so far we only know of one planet that has life. Western Slope Skies is produced by members of the Black Canyon Astronomical Society. This episode was written and recorded by Park Ranger Angela Lexvold of Black Canyon of the Gunnison National Park.